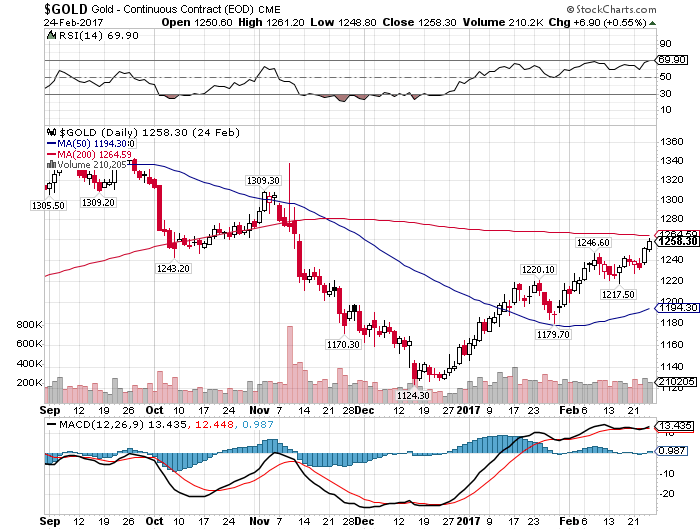 March market comments | American Precious Metals, Inc. The month of February gave us a strong gold buy signal, every day closing above $1,200 (the 50 day moving average) and now closing above $1,250 (the 200 day moving average), up 12% from December 2016’s low of $1,125. See attached chart. Silver is up from $16.20 to $18.30 during the same 2 month period. The speed of this reversal recovery is a little surprising. Some causes: In China, capital controls imposed on foreign investments has resulted in large volume increases in purchases of gold and gold ETF’s, the best option for trapped money. Political instability in Europe is sparking concern over the viability of the European Union and causing many people to lose faith in the euro. The entire commodity complex has been rising for the past year as the US dollar peaked. Gold is now rising in price in terms of all major currencies. Gold is also anticipating higher inflation. The Federal Reserve’s ruminations about raising short term interest rates no longer affect metals. Nor will they, in my opinion, until we see double digits rates again. That event is likely years away. At home, we are experiencing increased metal purchasing in the last week as trend followers jump in and short sellers get out of the way. The war on cash continues. If you doubt it, just try to get even a modest amount ($5,000) withdrawn without an interrogation from your bank manager or a delay. It’s too soon to start making price target predictions. The buy and hold philosophy is still intact though.